One of the earlier service providers and system integrators in Sabah has kick-started their campaign as soon as the FiT mechanism for renewable energy is implemented here. They held a mini roadshow at Suria Sabah shopping mall earlier this month, followed by a workshop at one of the better known hotel in Kota Kinabalu. I visited their booth but did not attend the workshop. "Turn the sunlight into cash". Possible if you are willing to invest. Their brochure illustrates the following investment and income generated from the venture. In this case, it is Solar PV installed on rooftop, with FiT at prevailing rate. This means that the investment is self-financing and at the end of the 10-year tenure, the generated RM850 is all yours. Good enough to pay up the electricity, telephone and water bills. 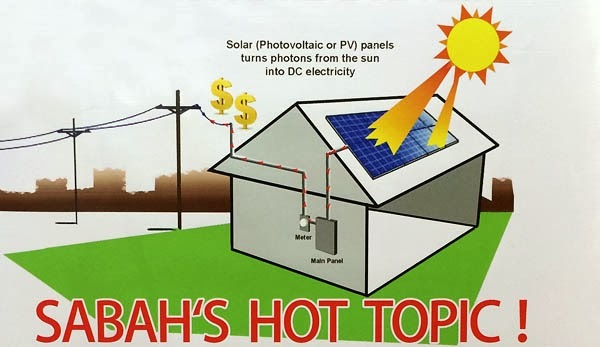 In a nutshell, the contract allows you to sell the electricity generated from your rooftop to Sabah Electricity Sdn Bhd (SESB) at a much higher price (actual rate to be known during the application process) for a period of 21 years. This is not an advertisement and therefore, no contact numbers are given. I have their numbers and the name of the persons to contact should anyone is interested. TheGreenMechanics: This is just one quotation/projection from a single solar PV service provider. Let's hope more service providers come up with more competitive pricing as prices of solar panels continue to drop.